Soil is a critical support system for trees and other plants, and its variable properties play an integral role in all other biological systems. Influenced by several factors, the formation of the region’s soil is dependent on topography, geology, climate, vegetation, elevation, and time, taking thousands of years to complete. The parent material is predominantly broken-down crystalline rocks composed of varying degrees of mica content and metasedimentary rocks. Additionally, precipitation levels range widely from 40–80 inches annually, thus affecting nutrient availability in soils. The interaction of these factors has led to unique and highly variable soil patterns and properties across the mountain region. Soil types are further categorized by permeability, porosity, and texture. Permeability is how quickly water moves through soil and the ability of water to be held for plant use. Permeability is partially affected by porosity, which is the amount of empty space between soil particles. Soil texture (the proportion of sand, silt, and clay) is an important determinant of drainage, water-holding capacity, aeration, susceptibility to erosion, organic matter content, and buffering capacity. 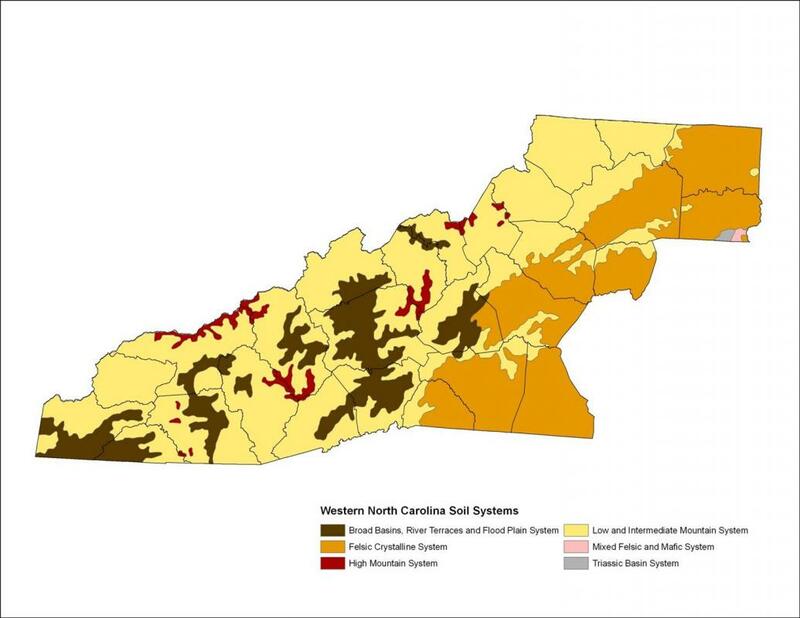 Three major soil systems are found in Western North Carolina, where their differing properties relate primarily to elevation change. A fourth type, the felsic crystalline system, is local to the region but occurs much less frequently, as it is similar to soils found primarily in the Piedmont region. This system is characterized by wide valleys and low, rounded hills with few steep slopes. Easy access, a temperate climate, and pleasant landscapes make these areas desirable for development and have historically been the region’s urban, industrial, and agricultural centers. This is the youngest of the three systems. Although prone to flooding in the river basins, these soils are ideal for agriculture, as higher elevation soils have shifted downward over time, increasing soil productivity. These soil profiles have relatively higher temperatures that enable microbes to break down organic material, thereby increasing nutrient supply and water-holding capacity while improving soil structure and preventing erosion. Soils in nearby river systems provide much needed water storage as well as water filtration for the region. Consider this with the flood mitigation that floodplains provide by allowing space for overbanking waters, making these soils a valuable resource. WNC’s riverine soils are some of the most productive in the world, and also account for some of the most rare (less than 2% of the region) and are highly sought for agricultural use. Most contain medium to high levels of organic matter, highly productive percentages of sand, silt, and clay, and are well drained. This, coupled with a moderate climate and adequate water supply both from rainfall and associated river systems, makes these soils extremely valuable and precious for agricultural sustainability for the region. These soils supply fruits, vegetables, and forages for many regions outside of Western North Carolina. These soils are a resource critical to the success of agricultural operations and to the health of local vegetation, making it important to understand the consequences of the loss or erosion of these extremely rare resources. Found between 1,400–4,600 feet above sea level, these soils are influenced by elevation, slope aspect, exposure, and vegetation present. Typically taking hundreds of thousands of years to form, the predominant features include steep slopes and ridges, as well as steep, narrow, and wet valleys. These are the most common soils below 3,000 feet and have well-developed profiles. They are acidic and highly weathered, and are often colored red, orange, and yellow. High mountain systems are generally found above 4,600 feet and have unique characteristics. Their formation is limited by frigid temperatures, resulting in less developed soil profiles with minimal microbial activity. Vegetative cover includes spruce-fir stands as well as heath and grassy balds. High elevation frigid soils are characterized by organic, rich soils and cool, moist microclimates. Low temperatures significantly reduce the rate of decomposition and increase the amount of leaves and decaying vegetation, yet their slope aspect, difficult terrain, and rocky soils limit their use for agriculture. Found at the highest peaks, these soils support forested vegetation, which provides timber, habitat for wildlife, and watershed protection. The forests on these sites contain northern hardwoods and conifers, resembling cool, moist, temperate forests of the northeastern United States. Fens are high mountain wetlands containing soils that differ significantly from most other soils found in the region. Fens are the result of acidic groundwater seepage to above the ground’s surface. High levels of calcium as well as other minerals are found in these soils, making it possible for only select vegetation to thrive. Mountain bogs are generally inundated with water, fed by groundwater seepage, rain, and snow. Their primary location is valleys and at the feet of gentle slopes. Predominant vegetation includes rhododendron thickets, as well as mixed stands of red maple, eastern hemlock, and eastern white pine. Overgrazing has occurred in nearly all of the bogs. In addition, non-native invasive species and flooding by beaver dams threaten their viability.